The gold, ceremonial ground-breaking shovels had yet to be stowed when the roar of big diesel engines broke the morning’s stillness November 28th, 2017. With that, construction on the Lewiston-Nez Perce County Regional Airport Operations Building (AOB) was underway. 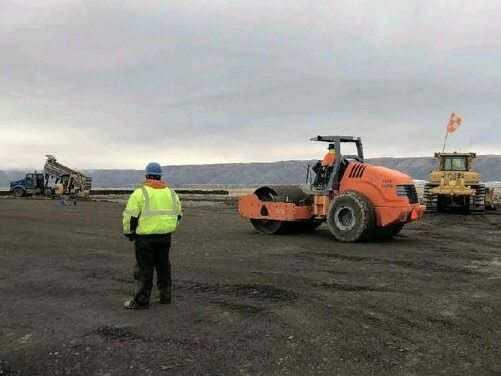 Prime contractor Ginno Construction of Coeur d’Alene and a slate of subcontractors including Lewiston’s Albright Construction immediately moved onto the field in what would soon look like a military exercise with dinosaur-sized earthmoving equipment. The $6 million complex will put more than 13,000 square feet under one roof, housing two large ARFF vehicles, one or two diesel-powered snow brooms, and another two or three plows. Select administrative and airfield maintenance functions will also be moved to the new location on the airport’s south side.